We are currently committed to three regions in Shanxi Province: Taiyuan, Yangqu, and Jinzhong (aka Yuci) all within an hour’s drive. Located east of the Yellow River and bordered by the Great Wall in the north, Shanxi Province, also known as Hedong, has a population of over 35 million. Its capital is Taiyuan, an industrial city that serves as the province’s transportation hub and whose population is over 4 million. Evergreen has its international office in Taiyuan, with satellite offices in both Yangqu and Yuci. Shanxi sits at a relatively high altitude on a plateau (average of 800 meters, or 2600 feet above sea level) and has a dry climate with four distinct seasons. 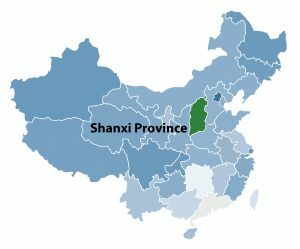 Shanxi is the leading producer of coal in China. It is also known for its heavy industry of chemical production, metal refining and power generation.